IBC missionaries to India, Madhu and Jamin Padhia, have returned to India after spending the a few months in the US visiting family and friends, raising support, and ministering around the country. Madhu has been involved in Christian ministry in India since 1998. He has formerly worked as a professor at a Bible institute, evangelist, counselor, and administrator of mission-run social work agencies. 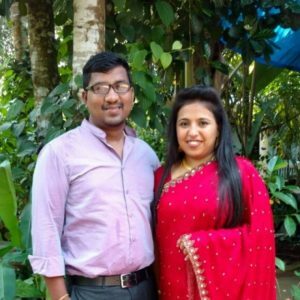 Since his marriage to Jamin Subramanian, they have been serving the Lord together in India through International Bible Conference. Jamin has previously been involved with International Bible Conference as she organized and performed concerts to raise awareness and financial support for the ministry. Following their calling as a family, they now serve in India to build-up the local leadership in churches in India. They do this by traveling to churches in both urban and rural parts of India to train, equip, counsel pastors and others in local church leadership in India. They are also involved in discipleship and evangelism as they provide counseling to young adults from different walks of life.